A selling exhibition for The Cure Parkinson’s Trust, Cure3 2018 takes place at Bonhams, London from the 25th-28th October. Created to raise awareness and funds for The Cure Parkinson’s Trust, and Parkinson’s research, Cure3 2018 is the 2nd edition of the renowned exhibition devised by Artwise in association with Bonhams. The exhibition is an opportunity for individuals to buy beautiful – and highly collectable – artwork by both major names and rising stars, while also supporting the vital work of The Cure Parkinson’s Trust. 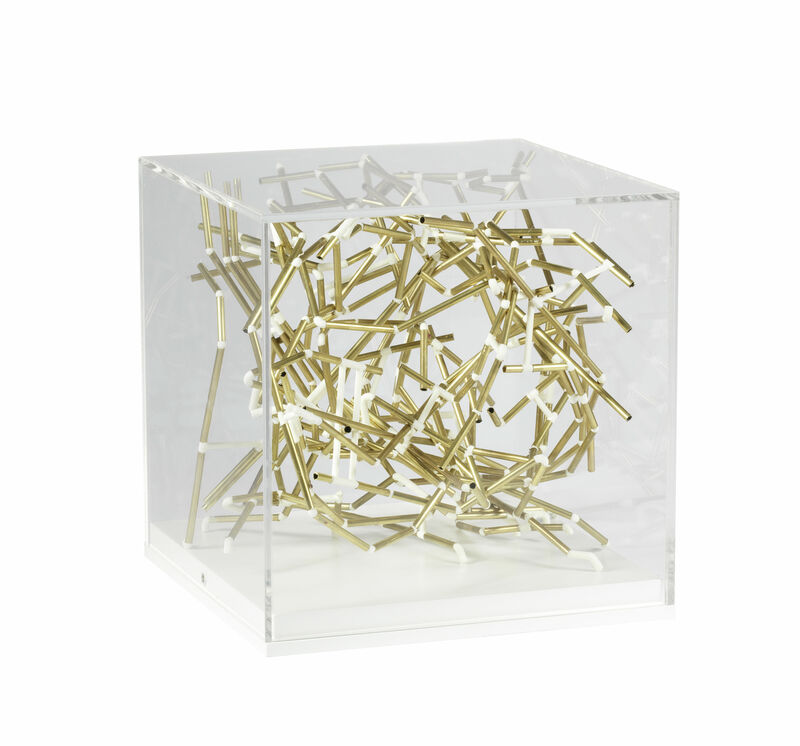 Each piece of work has been created using a bespoke 20cm squared Perspex box; the artists have used the box as inspiration, resulting in a range of approaches and interpretations both inside and ‘outside’ the box. The cubes will be showcased to the public at Bonhams in London from the 25th – 28th of October, with the cubes available to purchase from 9am on the 26th. All of the architects' cubes have been priced at £6,000 each. The first exhibition, Cure3 2017, was a critical success and raised over £300,000 for The Cure Parkinson’s trust – making the exhibition one of the new additions to the international art calendar that should not be missed. For Cure3 2018, 82 artists are participating in the exhibition, including 11 internationally renowned architects. One such cube, by Spencer de Grey of Foster + Partners, is a macquette for the staircase in the Foster + Partners' designed Bloomburg HQ. Returning artists for 2018 include Sir Peter Blake with a companion piece to last year’s cube, titled Robin Hood Came to The Picnic; and one of Britain’s most celebrated portrait artists Jonathan Yeo, with Study for a Portrait Sculpture. “I'm very happy to participate again this year as the charity does such great work and it’s an original and interesting challenge to create something in the format of a three-dimensional cube,” says Yeo. New artists – or ‘Cubists’ - for this year include Sir Anish Kapoor and the legendary 103-year-old Cuban-American painter, Carmen Herrera. The notable new names for 2018 also include the 11 architects, who have been specially invited to create their own cubes. 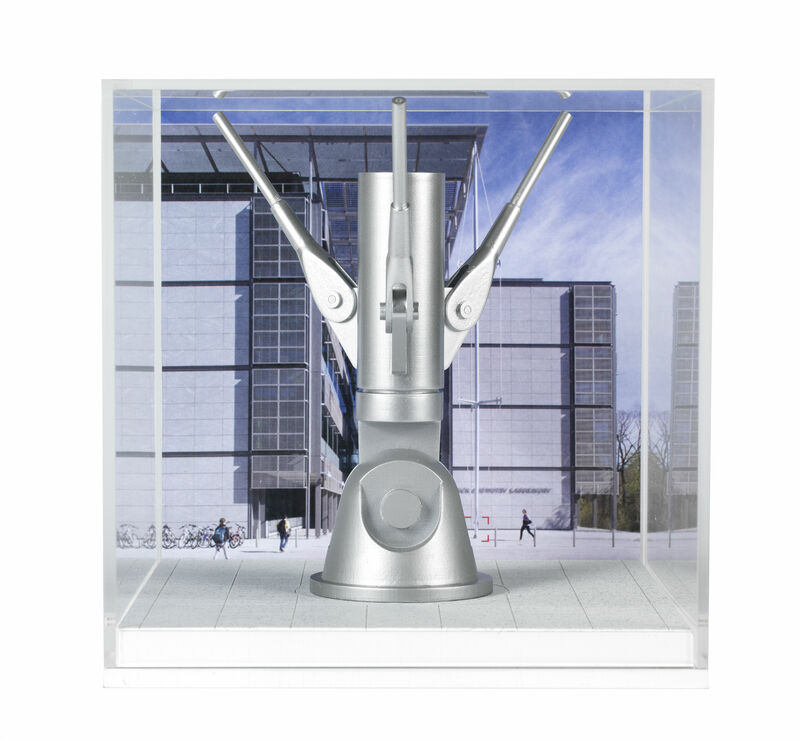 Including pieces by Zaha Hadid Design, Nicholas Grimshaw (Grimshaw Architects), and Chris Wilkinson (Wilkinson Eyre Architects), Cure3 offers visitors the unprecedented opportunity to purchase domestic scale works by these acclaimed architects. "Architecture specifies the measurements of materials and space between them," says architect Peirs Gough of his cube. "n this case a measurement device makes the work. 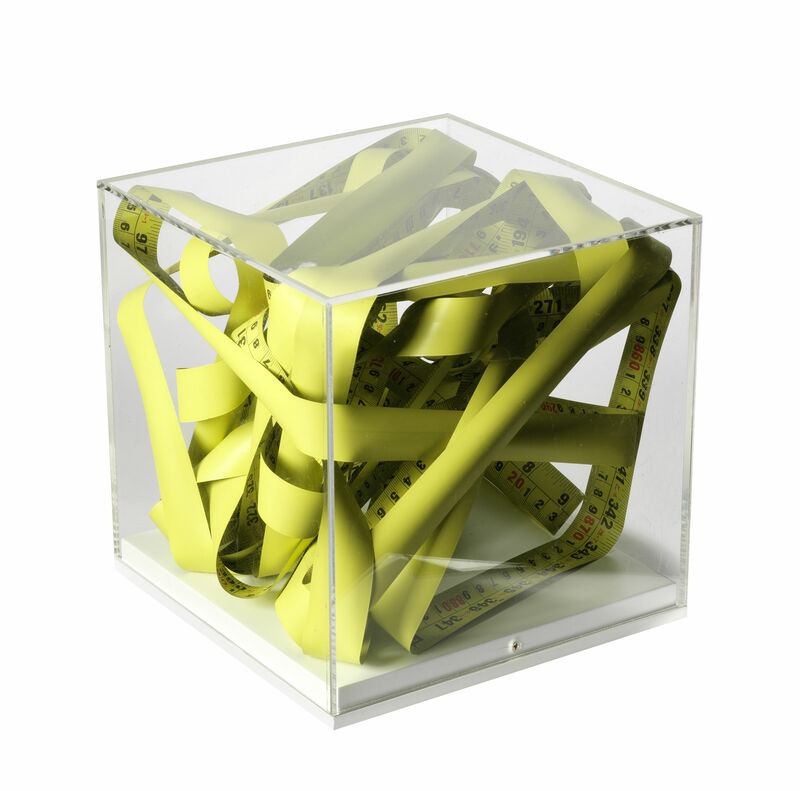 A 10m tape is compressed into a cube, hence the title 10m cubes or 10m cubed." Another architect taking part, Michael Hopkins, said, "This 1:5 model is of the base connection of a freestanding column that supports the canopy over the entrance to the Frick Chemistry Laboratory at Princeton University. The model was made to study how the individual components of the column connect together to make an efficient, lightweight structural system." A charitable organisation co-founded by Tom Isaacs in 2005, The Cure Parkinson’s Trust has one bold aim: to find a cure for Parkinsons, by supporting and funding pioneering research into new treatments. Isaacs was passionate about the Cure3 project from the beginning, and it was his description of living with Parkinson’s as feeling like being ‘boxed in’ that inspired Artwise to create the concept of the cube. Sadly, Isaacs passed away on May 31st 2017 – Cure3 2018 is dedicated to his memory and incredible achievements.